Our custom ecommerce website design solutions will enable you to run an ecommerce website on the internet in a user friendly manner. Our affordable solutions will get your ecommerce website up and running with the minimum amount of fuss, enabling your business to start selling online immediately. Online Shops are becoming one of the premier uses of the internet, with existing businesses or companies expanding into the internet sector. An ecommerce website is a great vehicle for making extra money for your business and has the advantage of being open 24 hours, 7 days a week and reaching a worldwide audience. We design our ecommerce web design solutions using a combination of a mysql database and the programming language php. 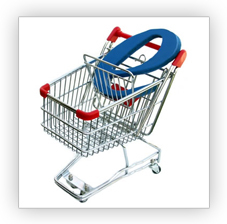 All our ecommerce sites encorporate a php shopping cart which is robust and very stable. Submission to Google, Bing and Yahoo! Credit card processing related questions or how payments are made by clients online using credit cards are some of the most common we receive. Do I need any technical knowledge ? You can run your own Ecommerce website with the minimum of technical knowledge, if you can fill out a form you can run an online shop. We provide an admin area for your online shop, to allow you to add products and categories to your shop in a quick and easy manner. Alternatively, if you prefer we can add all your products to your shop for you for a small additional cost. How much will an ecommerce website cost ? How much will an ecommerce website cost? Costwise, our online shops are very affordable from just $2000. This includes everything required for an online shop - A domain name, hosting, website design, a database driven shop, integration with a payment processor, basic optimisation and submission to Google.